With the help of third party on Android Lollipop you can easily show battery percentage on the status bar. But when you are working on the Android 6.0 Marshmallow then by default battery percentage does not shown on the status bar. Now, after reading this guide you can easily show battery percentage on status bar in Android 6 Marshmallow. If you recently upgrade software on your Android from Lollipop to Marshmallow then you have to get different interesting and useful features. System UI Tuner is one of the most important and useful hidden feature for Android Marshmallow. With the help of this feature you can easily customize the quick settings menu, enable battery percentage on the status bar, turn on demo mode and also customize the status bar as per your need. 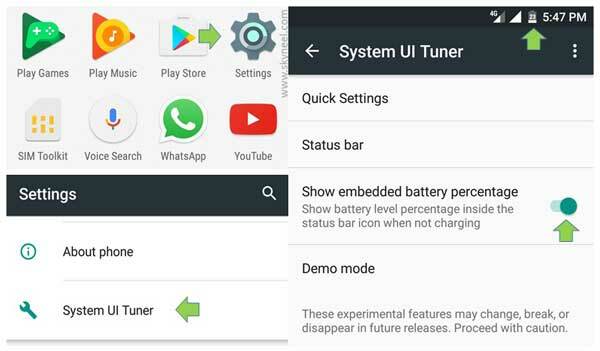 If you want to show battery percentage on status bar in Android 6 Marshmallow then, first you should know how to enable or disable System UI Tuner in Android 6.0 Marshmallow. After that not only you can quickly select your default apps but also customize quick settings of System UI Tuner in Android 6.0 Marshmallow. Step 1: First you have to enable the System UI Tuner on your Android 6.0 Marshmallow. Tap on the “Settings” option on your phone and tap on the “System UI Tuner” feature. Step 2: Turn on following given option to show battery percentage on status bar in Android 6 Marshmallow. After turn-on this feature you can easily view battery level percentage inside the status bar as an icon. But when you plug in your phone for charging then you are not able to view the battery level percentage. I hope this is a simple trick which helps all novice users to quickly enable or show battery percentage on status bar in Android 6 Marshmallow. If you have any suggestion or query regarding this guide then please write us in the comment box. Thanks to all.